Hope you are all had a lovely weekend and Easter break. I am always so, so grateful, feel so privileged when ‘companies/brands’ kindly *gift me products from their range to try. 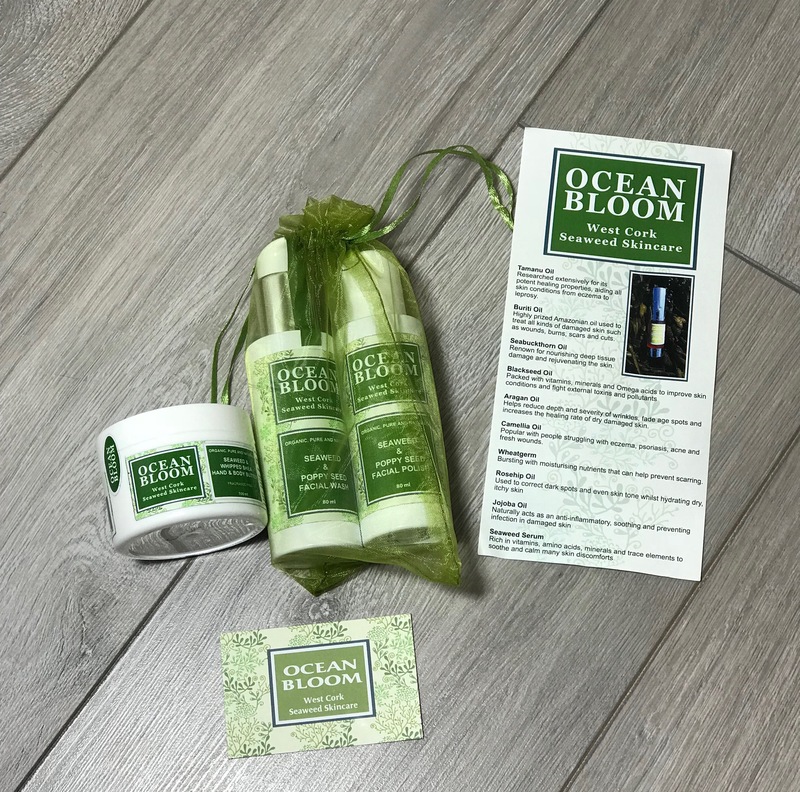 One such company who recently sent me three products from their range was Ocean Bloom Organic Seaweed Skincare from West Cork, Ireland. They kindly sent me ‘Fragrance Free‘ 80mls of their seaweed & poppy seed Facial Wash & Polish (duo came in a beautiful green see through drawstring bag RRP 28 Euro for duo) and a 100ml of their Seaweed & Whipped Shea Hand & Body Butter. Although these are ‘fragrance free’ they do still have a quite strong ‘natural’ fragrance. 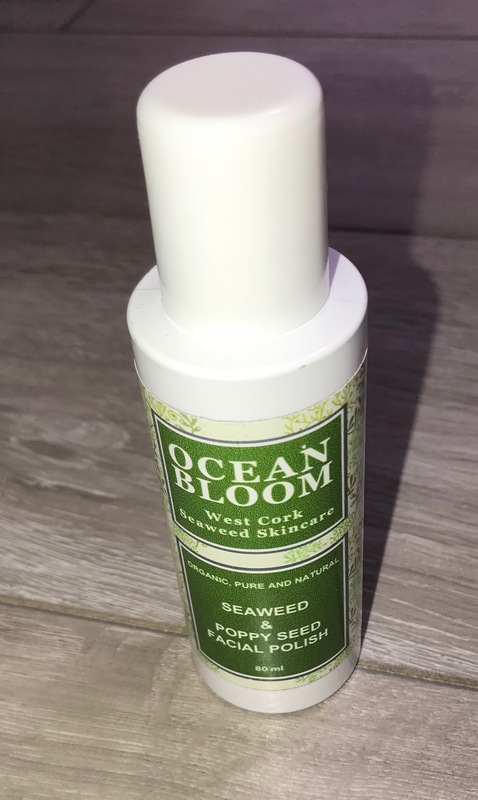 Ocean Bloom is based on the beautiful Beara Peninsula in West Cork, Ireland and their website states ‘Ocean Bloom natural skincare products contain seaweed extract and infusions made from seaweed gathered from the clear and pure Atlantic waters that surround the Beara Shores. They have blended the seaweed extract with some of the richest oils from around the world resulting in an amazing, seaweed skincare range. None of their natural skincare products will ever be tested on animals, they do not contain any parabens, SLS, silicones, sulphates, petrochemicals, mineral oils or any other nasties and they have no plastic beads’. You can find out more about the Ocean Bloom range via the link here. I do like the practical white packaging however as advised before prefer when brands emboss details on their packaging as dislike the way some brand’s stickers start to ‘move’ with usage and then start to look grubby. The trio of products I received are all fragrance free however fragrance versions are available too, which I personally may prefer but more about that later. The Seaweed and Poppy Seed Facial Wash is described as designed to brighten skin tone whilst gently cleaning the days impurities from your skin. Bursting with vitamins B, C and E this facial wash will leave your skin feeling renewed and refreshed. Directions: Apply to wet skin and massage to promote younger looking healthy skin, rinse with warm water and pat dry. Use twice daily for best results. This has a pump applicator which I prefer and has a creamy consistency but although fragrance free still has a light ‘natural’ fragrance (all 3 products have the same ‘natural fragrance though the hand & body cream has the strongest fragrance). I applied / apply as directed and does remove makeup easily although I always remove my eye makeup with cotton pads and micellar water first. It does leaves my skin feeling clean and looking refreshed, not too dry but there is still a slight tightening feeling before I apply my serums. No irritations and although I think is quite a good cleanser not for me personally as results just not as good as with my ‘hero’ L’Occitane Shea Cleansing Oil. Although I still would recommend trying especially if you prefer creamy rinse off cleansers or have an oiler skin as it does seem to help tone your skin as well. The Seaweed and Poppy Seed Polish states: contains Mother of Pearl and crushed Volcanic Rock to gently exfoliate your skin whilst the Seaweed infused Glycerine oil soothes and locks in moisture. Directions: Apply a small amount to wet skin and gently massage to promote a healthy cleansed skin. Advised to use 2-3 times a week for optimum results. This has a screw top and you need to shake to get this quite thick creamy exfoliator out of the bottle – would prefer a pump applicator as well but know might not work as well with the thicker consistency. I applied as directed and although does leave your skin looking refreshed, brighter and smooth to the touch, the granules are quite coarse, like heavier sand granules, not as fine a feeling as I usually prefer. However I would still consider purchasing because of the results and would recommend trying especially if you prefer a creamy exfoliator that actually feels it is exfoliating your skin as I found when you use this exfoliator twice a week it does help your skin to remain smoother. Comes in a screw top jar and has a thick creamy consistency. Although it is fragrance free this has the strongest ‘natural’ fragrance of them all and one I really do not like but saying that it is my favourite product out of the 3 items. States will leave your skin feeling instantly soft and scrumptiously fragranced as this body butter works it’s magic. Nourishing, healing, hydrating and soothing inflamed and irritated skin. As advised above this is my favourite out of the 3 items as it is the perfect multi purpose product. This cream leaves your skin feeling so smooth and soft to the touch and I personally found it also helped calm slightly irritated areas as well. It is also great to use as a hand / cuticle cream at night, as it takes a little while to sink in so not a fan of using it during the day as can leave a slight residue on papers / bags if you dont allow enough time for it to absorb. I have also used as a hair mask at night and when you shampoo your hair in the morning it leaves your hair feeling smooth and silky to the touch, just make sure you shampoo well to remove it. Think it would be great as an aftersun moisturiser as well. I am really impressed with this cream, far exceeded my expectations – I do also think it is suitable for everyone. I will be purchasing v soon but in the Pomegranate and Cranberry fragrance as the ‘natural’ fragrance free one is not for me. Definitely recommend trying it for yourself. Will also be checking out more products from the range. Currently when you sign up to the Ocean Bloom newsletter you can get 15% off (link at bottom of their home page) You can check out, see more from the Ocean Bloom range, stockists etc via the link here. Look forward to any comments you may have. Have you heard of or tried any products from this range before? If you are not already a follower would love you to follow my blog too – would mean a lot. Will have more posts up tomorrow and during the week. Thank you – take care and hope you all have a great week. That’s a very well written and informative post. I do like the look of the exfoliating cream and it’s a good size as exfoliating scrubs can be small at the dearer end of the market. I love phytopeel by Decleor but it’s a tiny size and over 20 pounds a pop. It only lasts for around two weeks. I haven’t heard of this brand so it’s great to now know and I’ve already googled it to have a look at their range. Thank you Susie – I agree some items work out a lot more expensive than others. That’s good to hear – hope you enjoy if you decide to purchase anything from the range. Hope you had a good Easter break and enjoy the rest of the week. Take care & chat soon. Check out my new post.. Its also on a lovely Ankara dress that can be worn to almost every occasion.